Diego Marino: Lentesplus.com is the first online shop for contact lenses in Latin America. We started operations in Colombia at 2014, and a few months later we opened Mexico. In 2015, Lentesplus.com arrived in Chile, and finally, in 2017, the website was available in Argentina. Thanks to our online business model, our prices are 20% – 30% lower than prices in the traditional market. Also, we have free shipping, a Customer Service team for every moment you need, a complete catalog of contact lenses where you can find the best set for your eyes. Last year, sales grow up 66% vs 2017 in the region. Our mission is to enable everybody to use contact lenses not as a luxury item, but as an important medical device that can improve people’s lifestyle in Latin America. No more high prices, no more time delays, no more complications. As a startup, Lentesplus.com has been recognized in Colombia, Chile and Mexico as an innovative alternative for buying contact lenses. More than 55.200 happy clients enjoy the new experience for visual health care in Latin America. Diego Marino: Actually, we are leading this transformation in the industry of contact lenses. In countries like Colombia or Argentina, there aren’t any other companies that sell contact lenses online. We work hard for keeping all our processes as innovative and practical as we can, and digital transformation is ideal for those changes. Diego Marino: Lentesplus.com works almost entirely in a digital environment. For us, technology solutions are the base for our job every day. One of our priorities is being a leader in technology advances in Latin America, so we can simplify the process of getting contact lenses to our clients and offer a greater experience every time. Internally, technology advances help us a lot from tracking data management, improving the knowledge about our clients and securing great insights for the growth of the company. Diego Marino: Definitely, we cannot ignore the telemedicine. It’s the next step in the industry of visual health care. This technology brings you the opportunity of getting evaluation, diagnosis and treatment by a visual health care professional remotely, leveraging telecommunications technology. Diego Marino: We are working towards complete integration within every part of our logistic process. This means two things: 1) reading in real time the contact lenses inventory from manufacturers and wholesaler in the countries we operate and 2) connecting with 3PL players to make the process more scalable and smoother. This means better employee productivity, more customer satisfaction and more value for our customers. Diego Marino: Yes, we do. And it’s a vital part of our team. Diego Marino: We had a big challenge getting the right information to customer, not only about inventory levels and availability but also when and how it will arrive. Also, information was not flowing in real time. 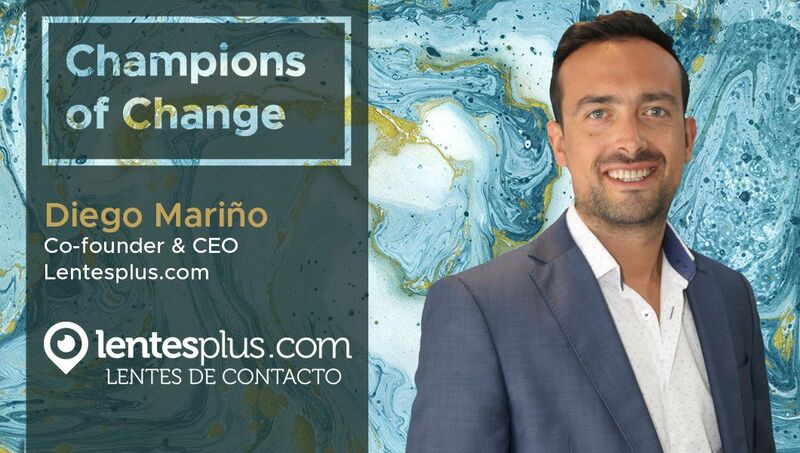 Diego Marino: We are working to integrate our CRM with Hubspot, as a principal tool for organizing our work, improving our relationship with our clients and growing sales. Diego Marino: Mobile is one of our priorities in the continuous improvement of Lentesplus.com. Almost the 70% of our traffic comes via mobile. At present, we’re improving the mobile experience of our website, and eventually, we’re considering developing an app. Diego Marino: We’re always checking our competence and similar websites in developed markets. There’s a lot of newsletters about eCommerce and digital marketing, we Hubspot Academy and newsletters like the LAVCA (Latin American Venture Association) very interesting as they keep you informed on what ventures are getting traction. Diego Marino: Lentesplus.com has a strong presence in Facebook and Instagram.